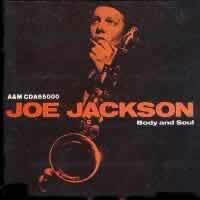 Joe Jackson - "Body and Soul"
Back in 1984, we didn't have a clue here rock and roll was going to take us. Disco was finally dead, thank God (Allah, Buddha, Mohammed, Zeus, insert your religious preference). Country rock went back to hills and Punk was giving way to New Wave and Alternative music. We were in the midst of transition. Bands with REALLY big (colored) hair and girls wearing solar panels as mini skirts, dancing in front of us on my MTV. Enter Joe Jackson. Joe had been around for a while already. He hit the major music scene in 1978. Who can forget (I wish I could), Is She Really Going Out With Him from his Look Sharp release. In the years that followed, Joe released five more records, most notably, Night and Day, an album some say was his best. Joe was no different than the times, he (apparently) didn't have a clue what kind of music he wanted to make. Keep in mind the album before Night and Day was Jumpin' Jive, a hepped up version of big band classics redone only as Joe Jackson could do them. Thinking about Jumpin' Jive brings back some great memories. I had the DJ at our wedding play a few cuts from that album. Imagine, everybody dancing to that immortal tune What's the Use of Getting Sober When You're Gonna Get Drunk Again, and Jack You're Dead (maybe there was something Freudian in that one). You should have seen their faces when we spun Planet Claire by the B-52's. It was a sight, but I digress. The reason I decided to write about Body and Soul isn't because the music but more so because of the recording quality and techniques used to achieve one of the better Rock and Roll recordings you may ever hear. The major awards presenters turned a deaf ear to this release, and wrongly so I might add. The songs on this album are quite good, not spectacular, but really good none the less. Joe Jackson was looking to do something a little different with this release. He felt the music of the day was too predictable. After searching for sometime for the proper recording venue, he settled on a Masonic Lodge in New York City. Vanguard Studios used this hall quite often for orchestral recordings. What really impresses me is the recording quality. It is truly stunning, considering. Why did I qualify that? Let me tell you. The main recording was done with just two microphones. They were Neumann M-50's suspended 15 feet (4.5 meters) above the band and it was mastered on a 4 track machine. They also close mic'ed the instruments but used that recording very carefully so they wouldn't destroy the ambiance they were trying to achieve with this hall. What was the result? An awesome recording. Absolute, natural decay of musical notes and voices. Uncolored (and unprocessed sounding) ambiance. Just a huge sound. It's almost as if your are the only one there in the hall listening to the sound check for the band before the big concert that night. It's really impressive. Natural, crisp treble from the cymbals, firm, deep bass from the guitar and a wonderful rich resonance from Joe's piano and sax. It's chocked full of detail. Very few of the instruments sound thin, or worse yet, sound overdone. Now, something I haven't told you yet, Body and Soul is digitally recorded and digitally mastered. I know you (analog) purists out there will immediately discount this album, fine, it's your loss. For the rest of you still reading, don't "them" convince you that digital is an inferior medium to record on, that's just plain hogwash. Analog can sound just as bad as digital if done improperly and visa-versa. This album is extremely well recorded. What's to loose? $5 at your favorite used records store. What's to gain? A great recording with some pretty good music that doesn't sound too dated (early 80's post-punk). Who knows, this album may even find it's way into your "demonstration disc's" that we all have to impress newbie's to our listening rooms. As a side bar, I've almost convinced myself, one of the main reasons audiophiles gravitate to classical music is because of the recording quality. Body and Soul shows that IF you care more about sound quality than heavy mixes and overdubs, you can produce one hell of an album regardless of the genre. It also helps if you are a good musician. Just a final thought, do you think it would be too much to ask that ALL recording engineers and producers be required to use this album as part of their study curriculum?